The National High School Athletic Coaches Association (NHSACA) and the Nebraska Coaches Association (NCA) recently announced the advancement of 14 coaches and an athletic director as finalists for the National High School Athletic Coaches Association national coach of the year. The nominations were based on each coach’s career accomplishments through the 2017-18 athletic seasons. Two former Nebraska prep coaches will be honored by being inducted into the national high school coaching hall of fame as well. Exeter-Milligan head volleyball coach Darcy White is among the Nebraska nominees. 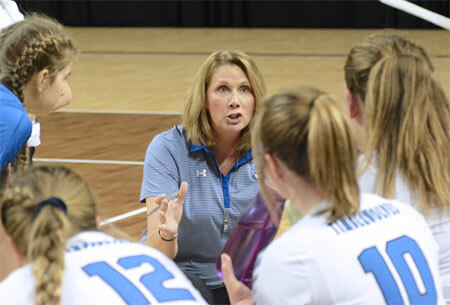 White, who notched her 500th career volleyball coaching win last season, has enjoyed tremendous success at the helm of the Timberwolves. E-M has qualified for the NSAA State Volleyball Tournament nine out of the past 10 years (finished 21-9 in 2013, but failed to advance to Lincoln) and has been crowned State Champion five times during this decade of excellence—Class D-1 Champions in 2009, 2010 and 2012; and Class D-2 Champions in 2015 and 2017. The Timberwolves, who have a record of 22-7 in Lincoln in 29 matches, were also D-1 State runners-up in 2011, and third in D-2 in both 2014 and 2016. E-M was in four straight State volleyball finals from 2009 through 2012. In the past five seasons, E-M is 128-32 with two State Championships and two third-place finishes. In 2014, the Timberwolves with just two seniors and 13 underclassmen started the season slow (11-5) before finishing second in the CRC Volleyball Tournament to Giltner. With a District final sweep of Johnson-Brock, E-M advanced to State—losing to Giltner again, and defeating Wynot and Lawrence/Nelson to finish third. Madison Horne and Amber Pribyl were seniors on this team. In 2015, the Timberwolves downed Hampton for the CRC title, but later fell to the Hawks in sub-districts and needed a wildcard to advance to State. E-M made great use of its second chance in Lincoln and downed O'Neill St. Mary's in five sets to become State Champions. Marissa Howard was the lone senior on this squad. The Timberwolves finished 28-5 in 2016 and took third at State—losing to Wynot and downing Chambers/Wheeler Central for third place. Hampton turned the tables on E-M and won the 2016 CRC Tournament. Seniors on this team included Haylee Sheffield, Sidney Hall, Samantha Horne, Hailey Luzum and Ashley Benorden. E-M was again on top of the volleyball world claiming its fifth State Championship in 2017. The Timberwolves began the season slow (8-4) and fell to Meridian in the CRC Tournament final. E-M responded with a sweep of Falls City Sacred Heart in the District final. The Timberwolves needed a fifth set to get past pesky Mead in the first game in Lincoln. Next, the Timberwolves defeated Hyannis before sweeping Ewing in the D-2 final. Seniors on this team were Hannah Beethe, Katie Mounce and Tara Mueller. E-M lost in the opening round of the 2018 State Tournament after a 23-9 campaign. Eight finalists from across the nation, in 19 recognized sports categories will be honored during the National Coach of the Year Awards Banquet which will take place at the NHSACA’s National Convention in Bismarck, N. D., on the evening of June 26. The highlight of the banquet will be the naming of the NHSACA National Coach of the Year in each sports category.